Rachel Sermanni is a Scottish folk musician from Carrbridge, in Strathspey. She has toured with a number of well-known folk and indie artists in the United Kingdom. Her first album was released in September 2012. Sermanni was influenced by musicians such as Eva Cassidy, Van Morrison and Bob Dylan and often talks about vivid dreams that slowly transform into songs. She developed and understood performing when she began listening and performing Scotland’s traditional music at school. One of the first songs she wrote at 16 was featured on the first album despite it being four years old by the time of its release. Later she performed in pubs around Glasgow, where many have a traditional music night. In September 2009 she went to see Mumford and Sons at the Loopallu festival in Ullapool. After the performance, she found them in a pub “and asked them if they wanted to jam”, resulting in a jamming session on the beach. In 2011 she supported them at Dingwalls in London. Sermanni also toured with Fink on his European tour in 2011, was showcased at the Celtic Connections festival in Glasgow, has supported Elvis Costello and Rumer, and performed at 150 gigs between June 2011 and June 2012. At Eden Court, Inverness Sermanni continued her tour for the Tied To The Moon album. The stage was set for Rachel Sermanni, with drifting smoke above the musicians heads, with a black backdrop, and “a hundred year old piano.” The lass sings like an angel and talks like a pixie; dressed in a long flowing sleeveless red skirt and top, pale skin, long tied back but flowing brunette hair, her amethyst green eyes (the green amethyst stone clears disharmonious energy, activates your inner vision & enhances your heart based spiritual connection to Mother Gaia. ), she opened up her set with two mesmerising slow tracks played on her mandolin, what a great start. Rachel then got more upbeat, playing several tracks on her electric acoustic guitar, backed up with a bass guitar, piano, drums and cello. She then gave us a couple of stories during her tracks, one was about nightmares, though when one woke up and recounted them, they turned out to be “quite funny”, such as the one were Rachel’s cat was dreamt drinking and smoking, whilst in another dream she was a woken in beads of sweat by someone splashing water on her face in her “nightmare”. One of the tracks she played was called Sleep which was a very smooth melodic track, whilst Marshmallow Unicorn was a much slower track which gripped the audience, we were now truly under Rachel’s spell, with lyrics that repeated in a chorus “ripple on a water she prays”. We were treated to other delights such as Tractor (named because the first lyrics were thought in a tractor, the rest of the lyrics came about a few months later after a bit of research on subject material), The Fog and Under a Mountain, to name but a few. 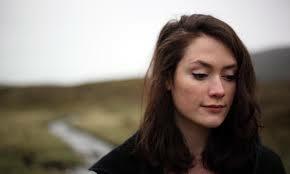 I had wanted to see Rachel Sermanni play in Aviemore a few months back, but was unable to make the gig. When I heard she was playing at Eden Court, I had to go and see her play; I was not disappointed a very talented musician, with a lovely joyous sense of humour, a joy to listen and watch her play. Her newest release, Tied To The Moon, was written over four days in an apartment above a pottery studio deep in the sticks of Nova Scotia, Canada, recorded in the Highlands of Scotland sees Rachel digging deep and offering a darker and more rhythmic flavour of poetry and music. Rachel Sermanni (vocals, electric acoustic guitar), Jennifer Austin (piano, organ and backing vocals), Gordon Skene (bass and cello) and Tom Terrel (drums, electric acoustic guitar, backing vocals) and Colin Macleod (recording and production), tracked all takes, live, in Colin’s living room in the Scottish Highlands.